Discover the Oregon-California-Mormon Trails on this tour and walk in the steps of the pioneers. 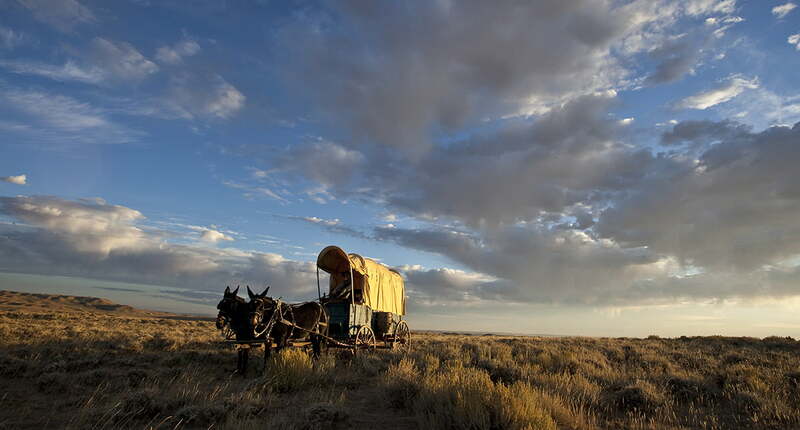 What was that spirit that drove these trailblazers to travel across high deserts and mountains to make a new life? The trails have stories of hardship, death and triumph. Visit Independence Rock, Split Rock, Devil’s Gate and Martin’s Cove to learn about this fascinating part of our history. Sam Peterson, a local historian who passed away in 1997, grew up in Fremont County and shared many memorable stories over the years. One story Sam told was of a hidden cache of gold along the Oregon Trail, just north of current day Jeffrey City. The grandson of Oregon Trail emigrants came to Fremont County in search of a gold cave his grandparents had found during their trek. The man’s family had taken refuge in a cave north of the trail during an attack by raiding thieves. The cave had a waterfall flowing over it and was the perfect spot for the women and children to hide while the men successfully fought off the thieves. When the men returned to the cave, they noticed a dull yellow metal on the cave wall. The group had no way of knowing whether the metal was true gold or fool’s gold. With little time to spare, they continued their journey and left the cave, vowing to return someday. The grandson arrived at Peterson’s homestead in the 1930s looking for the cave his father (one of the children in the original party) had described. Although they searched the area for days, they never found a cave with a waterfall. Maybe the lost gold still exists in the Sweetwater Rocks. The tour begins in Jeffrey City, a uranium mining bust town that today is moving towards revitalization with new mining activity. Although still a near-ghost town, Jeffrey City offers a convenience store and a bar/restaurant where the locals share drinks and tales. It’s a perfect starting point for the Sweetwater Trail, which follows the path of the pioneers. From Jeffrey City, follow Hwy. 287/789 southeast. Within 2 miles, you will have a view of Split Rock, named for obvious reasons, straight ahead. In 5 miles, Green Mountain, on your right, will become obvious while Ferris Mountain is off to the southeast and the Sweetwater Rocks are directly north. In 14.5 miles, you will come to the Split Rock Rest Area and Interpretive Site on the left, where a short walking path overlooks Split Rock Meadows. 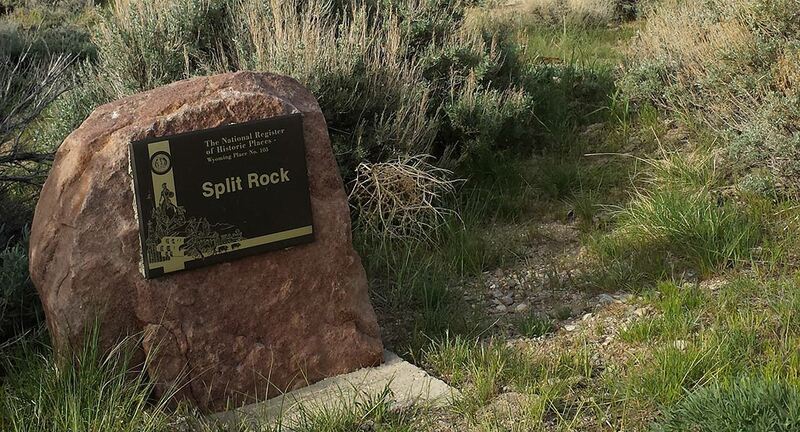 Signs describe a Pony Express relay station, wild horses that still run free and why Split Rock was important. Continue southeast another 8 miles to Muddy Gap Junction, where Ferris Mountain looms straight ahead. Take a left and go north on Hwy. 220 for 19 miles to Independence Rock State Historic Site. At Independence Rock a walking path allows you to see where emigrants carved their names in the rock. The site is named after the 4th of July, which is the date by which the pioneers hoped to reach the landmark to make it over the Continental Divide before harsh winter weather set in. Return to the highway heading back the way you came for just over 6 miles to Devil’s Gate State Historic Site, on the right. A short walking loop gives you an overview of the Sweetwater River and its importance to the emigrants. It was here that the Martin Handcart Company encountered a harsh October snowstorm that killed many and forced the rest to seek refuge in a cove. Back on Hwy. 220, continue south less than a mile to the Sun Ranch turn-off, also on the right. Sun Ranch is now owned by the Church of Latter-day Saints which has turned a historic ranch building into a visitor’s center and provides access to the publicly-managed Martin’s Cove. The BLM and the LDS Church have built foot paths from the visitor’s center to the cove and to Devil’s Gate. The round-trip walk to the cove is 4.5 miles. Back on Hwy. 220, return to Jeffrey City through Muddy Gap.